Kazakhstan’s brain trust had hoped that the Astana Economic Forum would generate ideas about preventing new global economic and financial crises. A lot of ideas did surface at last week’s event, but none was a silver bullet – a magic solution for warding off another economic or financial disaster. What the brilliant minds at the Forum did generate was a lot of insight into the previous crisis in 2008 and 2009, and ideas that could be developed to help prevent a new one. To be implemented, the ideas would require political consensus that would be hard to achieve, however. Robert Mundell, the Nobel Prize-winning Columbia University economist, said a big step toward preventing a new financial crisis would be establishing a fixed exchange rate between the dollar and the euro. Even better, he said, would be setting fixed exchange rates among the dollar, the euro, the Chinese yuan and the Japanese yen. Exchange rates now fluctuate, and when the swings are wild, countries holding the fluctuating currencies – or making debt payments in those currencies – can be hurt badly. If the four countries Mundell mentioned were to fix the exchange rates among their currencies, the world would have a more stable financial system, experts agree. The problem is achieving a political consensus among the four countries to do that. Because their economic situations and interests are different, such a consensus would likely be impossible to achieve at the moment. Another idea that could be a start toward a more stable financial system is having central banks diversify their reserve currencies rather than relying so heavily on dollars and euros. While “reserve countries ought to behave responsibly,” they sometimes don’t, he said. A case in point is the United States’ $1 trillion national debt – an issue that many speakers at the Forum said posed a new threat to the world economic and financial systems. Central banks’ “adoption of several currencies could mitigate” the threat, said Mandeng, who leads UBS’s public-sector financial advisory effort. Developing countries, which were hit hard by the 2008-2009 financial crisis, could play an important role in reserve-currency diversification, he added. The best way to achieve reserve diversification would be for central banks to get together “to establish a common framework ,” he said. Evidence that such a framework could be achieved is China, Japan and South Korea’s recent agreement to make many of their trade settlements in their own currencies instead of dollars, Mandeng said. President Nursultan Nazarbayev talked about the kind of consensus that Mandeng was discussing when he delivered the keynote address on the second day of the three-day conference May 22 to 24. The president said consensus, equity and fairness were needed to help reduce the disparity between developed and developing countries. He said decisions that the United Nations and other international organizations make that affect the global economic and financial systems should be done by consensus, not by a few dominant countries. 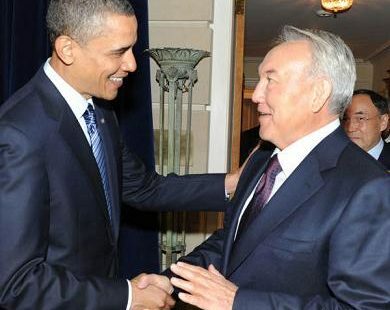 The crisis of 2008-2009 convinced President Nazarbayev that it was unfair for the wealthy G-8 and G-20 nations to set global economic policy without the rest of the world community having a say in it. The G-Global Initiative that he proposed last year would greatly expand the number of countries setting world economic policy – 70 is one figure that’s been mentioned. The expanded field would include many developing countries. President Nazarbayev said the 11 Nobel Prize winners at the Forum had proposed establishing a G-Global secretariat. He also urged Forum participants to do what they could to establish a G-Global mechanism at the United Nations. But it can’t be done with national policy alone, he said. “The financial world is global” – so what happens outside Kazakhstan has an impact domestically. Marchenko, whose policy-making skill has drawn international praise, said Kazakhstan’s economic and monetary policies are solid. But “we can’t fight the (kind of) drop in commodities prices” that occurred in 1999 and 2008, he said. When oil, gas and minerals prices plummeted because of problems in the developed world in 2008-2009, Kazakhstan’s extractive-industries-based economy sputtered. Layoffs occurred, Kazakhs couldn’t repay debt, and the banking system hiccupped. The financial system is still struggling, although some individual banks are in good shape. Because the financial system was burned so badly in the crisis, many “banks and pension funds are not investing the way they should” in business opportunities, Marchenko said. Instead, they’re putting a lot of money in U.S. Treasuries and the National Bank of Kazakhstan. Although this kind of investing generates a return, it doesn’t give Kazakhstan the economic pop that its leaders want to achieve more growth. Economic growth was 7.5 percent last year – one of the best showings in the world. But it might have been higher if banks had lent more to businesses. Marchenko said Kazakhstan has $41 billion invested in the United States, most of it in Treasury notes. The National Bank of Kazakhstan and the National Fund account for $36 billion of that while $5 billion is in private hands. The global economic crisis that enveloped Kazakhstan and the rest of the world in 2008 started in the United States. Given that Kazakhstan is so heavily invested in U.S. securities at the moment, “what happens in the United States could have a big impact here,” Marchenko said. Even more worrisome is economic weakness in several countries in the Euro Zone that, if not handled properly, could lead to another global financial crisis, other experts at the Forum said. Min Zhu, the deputy managing director of the International Monetary Fund, said the developed world’s combined debt contains the seeds of a new crisis. Debt in the United States, Europe and elsewhere will reach 116 percent of the developed world’s combined gross domestic product by 2016, he said. At some point, the wealthy nations will have to pare down the debt, Zhu said. The best approach, he said, would be a coordinated one – that is, countries working together on debt reduction. His message was that a heavy-handed, ill-thought-out or Lone Ranger approach could spark another global financial crisis. I have a few ideas about the Financial Crisis I would like to share with you. First of a number of points, which I believe are true, but may be debated. 2. There are some very wealthy Greeks. It may alleviate the crisis if Greeks acquire debt which is currently owed to foreigners. The Greek government could impose this in much the same way as taxes, and in some countries pension contributions. Clearly the same practice could be adopted in other countries, amounts would of course vary depending on local circumstances. For the poor, 2% and an income tax reduction of 4% (a net reduction in tax of 2%). For the very wealthy, in addition to swapping tax for the purchase, it would be reasonable to require a purchase of the tax payer’s National Debt. This is because they will be getting something for the reduction of disposable income. If people feel the “asset” is worthless, they very likely benefited form the country’s acquisition of debt, indirectly if not directly…. It is much more reasonable that they bare the burden of their countries bad debts, than others that have not benefited. The Government may also require, that wealthy individuals, domestic and expatriate hold 10% of their assets in national debt. The wealthy may not like this, but it is very likely that they have benefited more than the poor from the respective governments increasing national debts. The bankers and lawyers employed chasing this money would give some work to locals. I have been writing emails for a number of weeks now. To governments, elected representatives, political parties, newspapers, in different countries. Regrettably, I have not had any responses at this time…I guess this is to be expected, but it is disappointing. ….Just a few thoughts to ponder. After all a new problem needs new solutions.